Prometheus was a film that had a lot of Alien fans unsure of what they would be getting when they walked into that cinema. It started life as an Alien prequel, then it became an original science-fiction known as Prometheus. It was not clear if Prometheus would be related to Alien at all. Of course, it turns out it was. But it was an unclear time and an interesting film development. Whilst we wait for Alien: Covenant (another film that started its life as one thing and has seemingly changed into another), I decided to take a look at how its predecessor changed over time and how it went from one writer to another. The possibility of an Alien prequel was commented on as early as the late 1970s. The official Alien magazine published in December 1979 reported that one of the possible avenues that were being explored for the next Alien film would be a prequel: “A prequel, rather than a sequel, telling the tale of the Space Jockey and ending where Alien begins, with the arrival of the Nostromo crew.” Ultimately this take on a new Alien film would not emerge as the sequels veered away from the mysterious extra-terrestrial victim. Ridley Scott on the Space Jockey set on Alien. H.R Giger can be seen working on the creature in the background. Over the intervening years Ridley Scott would occasionally talk about his desire to return to the Alien franchise to specifically explore the Space Jockey. During one such occasion on the commentary that Ridley Scott recorded for the 20th anniversary DVD release of Alien for the Alien Legacy box-set, Ridley Scott mused about his ideas behind the Space Jockey and the Derelict. Following the tepid release of Alien Resurrection in 1997, movement on a new Alien film was virtually non-existent. Occasionally Ridley Scott, James Cameron or Sigourney Weaver would give the possibility a sentence or two in interviews but it wasn’t until over a decade later in 2009 that a new Alien film was looking like a reality. Having been impressed by his work on two science fiction scripts – Passengers and Shadow 19 – Scott Free Productions invited relative new comer Jon Spaihts to a meeting with Scott Free’s president, Michael Costigan, to discuss potential ideas for Spaihts and the company to work together on. Late in the meeting, Costigan brought up the topic of Alien, specifically an Alien prequel. It was a universe that Ridley Scott wanted to return to but they had been unable to crack the story. Costigan wanted to know if Spaihts had any ideas about it. At the end of the meeting Costigan asked Spaihts to write down his story idea (which would be known as Alien 01: The Master Narrative) so that they could be passed onto Ridley Scott, who was finishing post-production on Robin Hood at the time. In less than two weeks that story concept had worked its way from a document in the hands of Ridley Scott all the way to the top of 20th Century Fox and into the start of a film production. Ridley Scott’s brother, the late Tony Scott, was the one to reveal to the world that they were working on an Alien prequel. 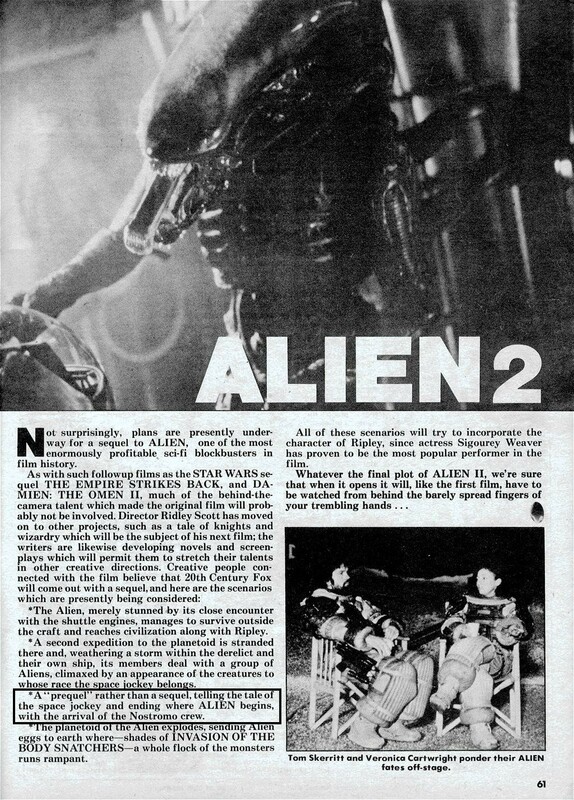 In May of 2009, whilst talking to Collider about Taking of Pelham 123, Tony Scott announced that the Alien prequel was going to be directed by Carl Rinsch, one of the advertisement directors at Scott Free. Ridley Scott was eventually announced as being attached to direct. Early reports made it sound as if 20th Century Fox were not confident in moving forward with the prequel without Scott in the director’s chair but it became quite clear that it was Ridley Scott’s own excitement towards the project that led to him taking over as director. Spaihts wrote the first draft in three and a half weeks, something he said to be “a personal record.” Following that Spaihts wrote another four significant drafts (with many “interim submissions”) over the next year or so. By April 23rd 2010 Spaihts was on his fourth draft; most likely the draft available online under the title Alien: Engineers. When that script was leaked online, Alien vs Predator Galaxy spoke to Jon Spaihts who confirmed that the script was one of the later but not the last draft he did. The subsequent draft would lose Weyland’s Wheel and the underwater excavation from the start of the script. When Damon Lindelof came on board in mid-2010 the current draft was titled Alien Zero. In Alien: Engineers, Watts (later Shaw) and Holloway uncover evidence of patterns in the evolution of the Earth and of mankind itself that suggests extra-terrestrial intervention – the Engineers. They convince Weyland of their evidence and he funds their exploration of what they believe to the be the Engineers homeworld which turns out to be LV-426. When they arrive there they find a system of complex pyramids that are actually terraforming stations as well as laboratories. Whilst exploring they find the remnants of Engineers and eventually stumble upon a proto-form of the Aliens as well as the traditional Aliens themselves contained within the cargo hall of a Juggernaut hidden beneath one of the pyramids. You can listen to a more thorough and detailed breakdown of the Alien: Engineers script in the 33rd episode of the Alien vs. Predator Galaxy Podcast. The prequel went under many titles over the course of development until they finally settled on Prometheus. It had been known as Untitled Alien Prequel, Alien Prequel, Alien: Engineers, Alien 01: Genesis, Alien: Origins, LVIVIIVI (LV-426), Paradise, Alien: Tomb of the Gods. 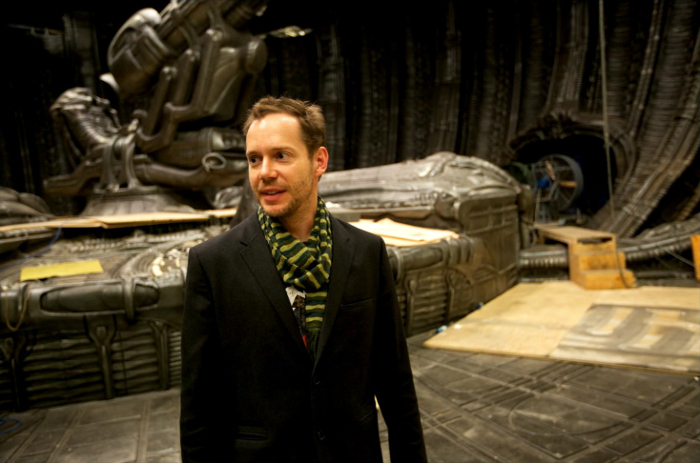 Jon Spaihts on the set of Prometheus. 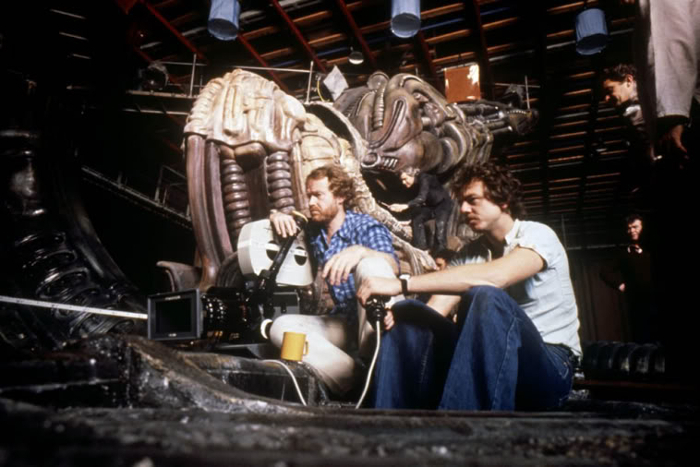 During the months of development on the early days of the film, Ridley Scott would often throw out ideas that would require Jon Spaihts to work those ideas into the script, to figure out a way to give those ideas meaning within the story. It became very much a story based around the concept of creation and evolution; the Engineers with humanity and the Aliens, and humanity and the synthetic, David 8. Whilst the majority of Spaihts’ basic structure would remain the same throughout production – even through Lindelof’s subsequent involvement and rewrites – many of the specific details would change. For example, throughout Spaihts drafts, the film would have taken place on LV-426 but this was changed to LV-223. Another aspect that changed several times was the Juggernaut and the pyramid complex. Over subsequent rewrites, a pyramid appeared beside the Derelict, very much as call-back to the pyramid from the earlier scripts of Alien that was ultimately dropped and merged with the Derelict. Eventually, the Derelict would be moved underground as a hidden part of the pyramid and become known as the Juggernaut. Concept art showing David 8 and Watts (later renamed Shaw) in one of the cargo holds of the Derelict in a scene that is shown in the Alien: Engineers script. When Spaihts had reached the fourth major draft (around April 2010), the crew began to be hired and work commenced on designing the film. He would often find himself in the artists room discussing the script and specific scenes and he would come back into the office the next day and find paintings of a scene he had just written the day before. Damon Lindelof’s involvement came when everyone was ready to move from pre-production to production. Being an unproduced writer, Spaihts had been expecting to see a better known writer become involved to provide some polish on his script and to have a more recognizable name attached to the writing credit. One of the writers that was contacted was Damon Lindelof, who at that time was very well known for his work on the television series Lost. Ridley Scott got in touch with Lindelof and sent him Spaihts’ latest and fifth major draft – at that point titled Alien Zero – and asked him to take a look and see what he thought. “So when I finished it I went into my office and I wrote an email to Ridley and his producing partners. And this response was basically my job interview. I wrote maybe a four or five paragraph email saying here are all the things I love about it, I think there are some incredible set pieces here, I love the fundamental idea behind the movie, I feel like it’s a cool think piece. BUT I think it’s relying a bit too heavily on the Alien stuff that we’ve seen now five or six times in different movies. Chest-bursting and face-hugging and xenomorphs and I just feel that your idea is so strong and the characters can be made so strong that we don’t need any of that stuff. The next day Lindelof was asked to meet with Ridley Scott where they discussed Lindelof’s email. Lindelof made it quite clear to Ridley and the other producers that his interest lay in the non-Alien aspects of Spaihts’ script. 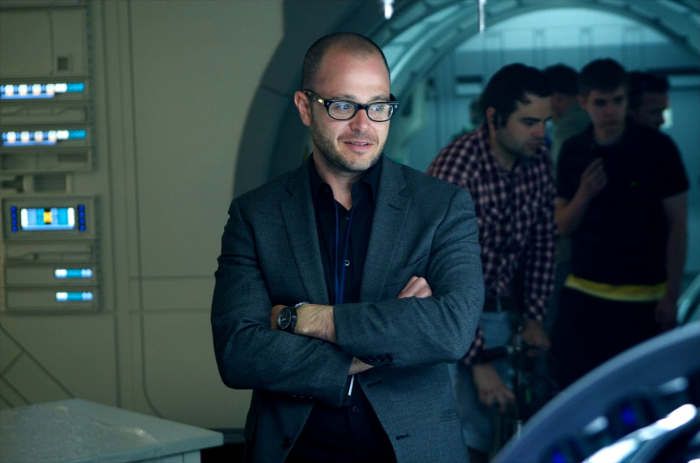 Damon Lindelof on the set of Prometheus. Having gotten the job, the next several weeks consisted of Scott and Lindelof sitting together, five days a week for three or four hours just talking. Lindelof would ask him questions to understand what it was Ridley Scott wanted from the movie – what he wanted it to be about. 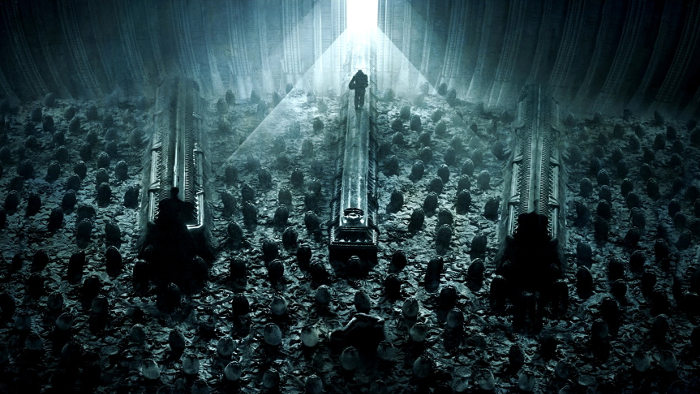 Lindelof’s work on Prometheus took place throughout July 2010 and into the start of August. Lindelof turned in his first draft after four or five weeks of work in mid-September. These rewrites would retain a lot of the core elements of Jon Spaihts’ work. It still included very obvious allusions to the Alien and the Alien life-cycle but stripped the script of the Aliens themselves. It would instead focus on the “original” creatures from Spaihts’ drafts such as the scarabs, the hammerpedes and the mutated Fifield. Lindelof would also play-up the creation angle, making it a story about searching out man’s creator to gain more life. It was a deliberate reversal of the theme of Ridley Scott’s other notable science-fiction, Blade Runner, in which man’s creation comes seeking its creator to ask for more life. Prometheus, still known to the world as the untitled Alien Prequel, entered production towards the end of 2010. On the 14th of January 2011 Prometheus was announced to the world. And the rest, as they say, is history. If Riddles went with Spaiht’s script, we would have gotten an Alien movie the likes of which would have contended with James Cameron’s Avatar. If you own The Art of Prometheus book it actually makes for a stunning visual reference if your reading the Alien Engineers script at the same time. Nicely done! Gives a good outline of events that are often foggy. Great piece, but I think it should be noted how Lindelof’s shooting draft differed from what made it to the screen as well, the hammerpede scene for instance was quite different than the one in the film; namely Milburn had his back turned to the hammerpede as it crawled on his arm, and the hammerpede was more like a mutant millipede in the script. And when the crew come to see what happened it is far more dramatic as they start fighting the hammerpedes with axes. Spaihts made a good first script, but I liked the direction taken by Lindelof. More interesting. I get why they hired Lindelof, but honestly, Spaihts’ version was the version the fans wanted. Instead, we got a mish-mash of half baked ideas and storyline tangents that never paid off. We also got a bunch of characters that were arguably some of the dumbest in science fiction history. Lindelof’s version was rife with ridiculously flawed logic. At least Spaihts’ made sense and had some fantastic set-pieces. Great timing, Cpl. Hicks, for this update. 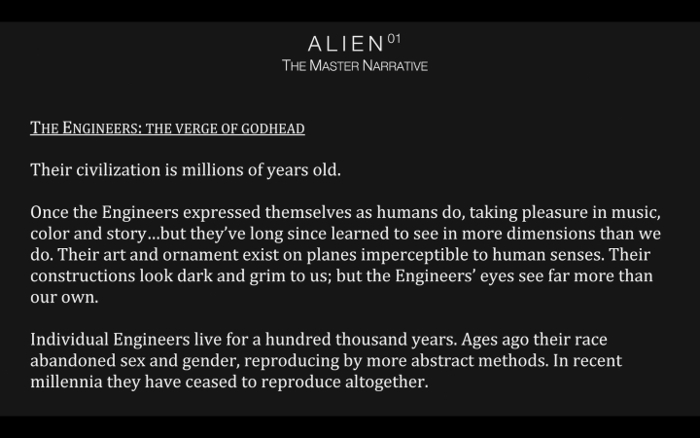 I was just finished reading Alien: Engineers thanks to your podcast on same. Thanks for both! Spaihts’ original script is SO much better than the illogical film that was eventually made.